As a banjo instructor with years of private lesson experience under my belt, I’d have to say the most common question I hear from students is how to move from learning and playing songs via tablature to being able to pick spontaneously with other players, often times with tunes they are unfamiliar with. In other words, how does one make the leap from playing set pieces to being able to improvise off the cuff with virtually any song thrown your way? Is this possible simply by learning to play and memorize tabbed-out arrangements of banjo tunes? How do you learn how to play bluegrass with other people? While learning to play bluegrass banjo via tabbed-out songs is an essential part of learning the instrument, it’s only one piece of the puzzle. There is another component that is vital in the “How-do-I-to-learn-to-play-banjo” equation. It is also, sadly, one of the most overlooked. What is this magic bullet, you ask? It is the simple act of observing a bluegrass jam. Don’t misunderstand me – I’m not saying all you have to do is go to a few jams and magically you’ll be able to play like Earl Scruggs. What I AM saying is that in order to be conversant in bluegrass banjo you need first and foremost to experience live bluegrass music. And while watching a live bluegrass performance or concert is an excellent way to add to your banjo education, if your ultimate goal is to figure out this magic trick called bluegrass banjo, it’s absolutely essential that you listen to and experience bluegrass JAMMING. If this can be done on a regular basis, all the better. 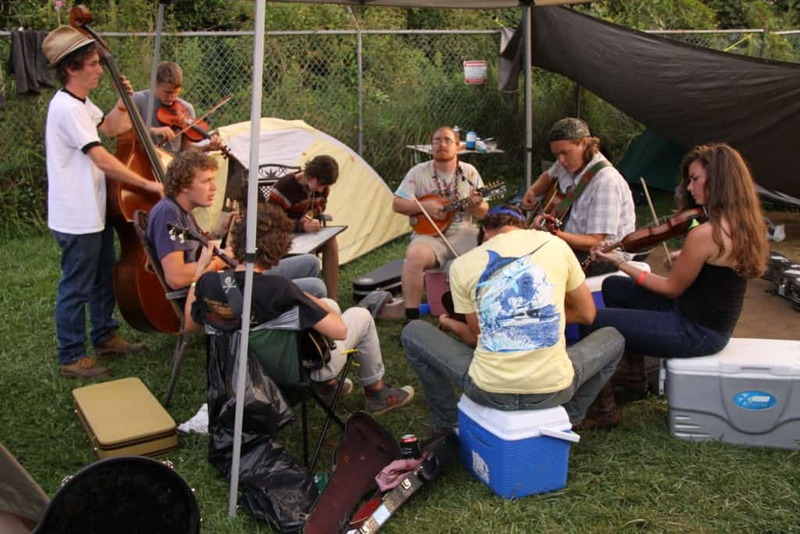 Oh, and did I mention – bluegrass jams are fun! Understandably, some students get a little scared about the notion of taking part in an actual jam (especially if they’re just starting out on the banjo). But let’s be clear here – when I talk about experiencing a jam, I’m not necessarily referring to the act of making music with other players. What I AM talking about is something you can do with very little or no banjo experience whatsoever: attend a bluegrass jam (preferably as many as you can) and observe every aspect of the event. This can be done well before you take your first banjo lesson or even touch your first banjo. I’m talking about an opportunity to observe bluegrass players making honest-to-goodness bluegrass music right before your very eyes. As a banjo student it’s one of the best opportunities you’ll ever get to witness the dynamic of live bluegrass being performed spontaneously. Soak it in. Stand close to a banjo player and observe both his etiquette and the etiquette of the other pickers. Watch how solos are divvied out. Become familiar with the songs. Observe the form. Is this the type of jam where solos (usually referred to as “breaks”) are taken in a specific order, perhaps going clockwise in a circle or are soloists just randomly called upon by someone leading the jam? Observe the give-and-take among the players. Pay close attention to the music – do you recognize any of the chords that you hear or, more importantly, see? Do you notice the moments when the song moves from one chord to another? Do the chords that the banjo players are fretting look familiar? Are you able to match any of these chords on your own instrument from what you’re able to see? Can you figure out what key they’re playing in (the chord that begins and ends the song)? If the banjo players happen to be playing rolls and not chords, do you recognize these rolls? Can you play them? What does the banjo player’s accompaniment sound like when someone else is playing or singing? Are they playing actual rolls or are they just vamping on chords? Do you recognize any of the licks that they are playing from what you hear? Are they using capos for a particular song? If so, are you able to figure out the key they’re playing in? It should be noted that none of these questions are ones you need to know the answer to. They are simply some of the many considerations you should be thinking about at any jam. And as you can see, there are endless things to think about! What’s important is that you remain curious about these things; this is how true learning begins. It’s also important to remember that this kind of learning doesn’t require you to pick one note – remember, this isn’t necessarily about facility on one’s instrument. It’s about familiarizing yourself with (and understanding) the form. And, ultimately, internalizing it. Alright, enough babbling – now go out there and find a bluegrass jam in your area and take that first big step in your banjo education today! I guarantee that if you make it part of your regular practice, the dividends will pay off mightily!